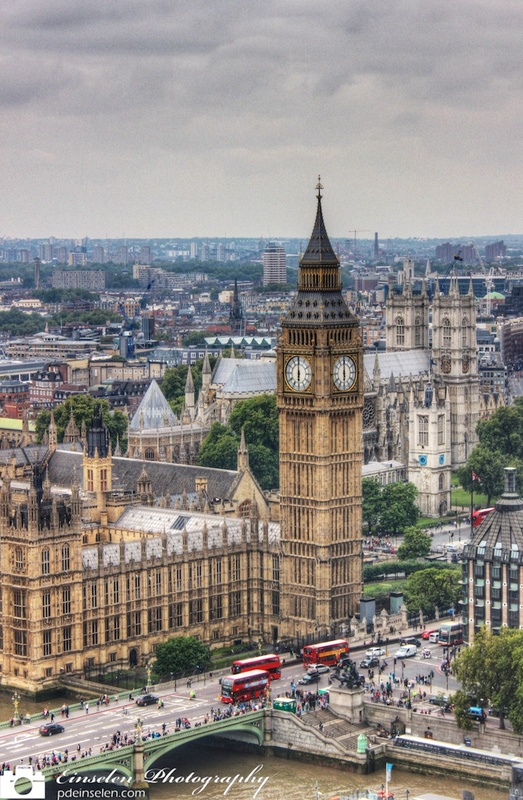 This is a HDR photo of Big Ben, however Big Ben is not seen in the photo as Big Ben refers to the bell in the tower. The name of the tower is the Elizabeth Tower and before 2012 it was known as Clock Tower. This shot is a 3 bracket handheld HDR photo taken from the London Eye. It was a challenge to shoot through the glass without reflecting the people inside the capsule. I also like this shot because of many aspects. First the time is 6 o’clock giving a straight North South line of the clock hands. Second there a three double-decker buses in front of the Palace of Westminster. The buses, as well as the Elizabeth Tower, are well-known icons of London. Third behind the tower is Westminster Abbey. Finally I love how you can see the rest of London as it trails off into the horizon.